Shaun O’Hara was born June 23, 1977 in Chicago Heights, IL and grew up in Hillsborough Township. Big and powerful, Shaun was drawn to football, and was a standout in the town’s youth leagues. He joined he Hillsborough High gridiron squad as a freshman in 1992. The star of the Raiders was another “Shawn”—Shawn Mayer—a two-time USA Today HS All-American. By his senior season, Shaun stood 6’3” and weight over 250 pounds. He was recruited by several schools as an offensive lineman, but decided to stay close to home and accepted a scholarship from Rutgers. The timing wasn’t great. Under coach Terry Shea, the Scarlet Knights endured losing seasons in each of Shaun’s four varsity campaigns. Shaun went undrafted in 2000 but received an invitation to the Cleveland Browns, who were coming off their “expansion” 1999 season. He played all over the line in 2000 and 2001 before settling in as the team’s starting center in 2002 and 2003. In 2004, Tom Coughlin was hired by the New York Giants to rebuild the club, and one of his first moves was to sign Shaun to a three-year deal. 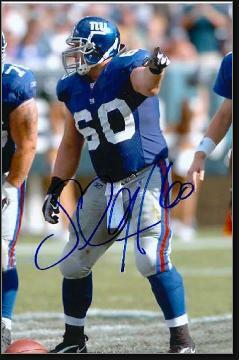 In 2007, Shaun was named co-captain and anchored a line that included Kareem McKenzie, Chris Snee and David Diehl. The Giants finished 10–6 and went on to win the Super Bowl. In 2008, Shaun was named to his first of three consecutive Pro Bowls and also earned All-Pro recognition. The 2010 season turned out to be Shaun’s last in the NFL. He sprained his right foot in a midseason game against the Cowboys, compounding the pain he was already experiencing from bursitis in his left ankle. The injuries kept him out of the 2010 Pro Bowl and kept him off the field in 2011. Shaun officially retired in 2012.